...but you'll look sweet - upon the seat - of a bicycle made for two! Due to fair and good weather conditions in the city from springtime - summer to autumn - and for outdoor fun in Copenhagen - we invite everyone to lend a cycle at your hotel and logging site - or pay for electric bicycle - or hire a bike at selected cycles shops - and explore Copenhagen - with all the historical places and cultural venues - together with all the amusing spots the biggest city of Scandinavia can offer. You can take a cycle tour and ride through Copenhagen - which will give you a good way to explore the city - and plenty of inspiration. Start at the Town Hall Square - and take the safe cycle tracks alongside "Vesterbrogade" - and pass Tivoli Gardens from 1843 - then pass the Central Station of Copenhagen from 1911 - and stop to admire the Liberty Memorial from 1779. All the way trough "Vesterbrogade" you will find a diversity of shops - and a bustling shopping area. 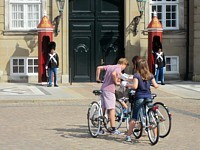 Pass the Museum of Copenhagen - and then cycle all the way to Copenhagen Zoo from 1859. Visit the neighbouring Frederiksberg Palace - and the pretty Palace Gardens from 1703. The cycle tour will take around 1 - 1½ hours - and is about 3,5 km. long one way. And in the cool fresh - frosty wintertime - just follow the “Vikings” of Copenhagen - and get some rosy blossom cheeks and crispy lips - while cycling in the city. Visitors can actually take cycle trips from the one end of the city to the other within 1 - 2 hours. Copenhagen is geared for cycles with over 350 km of safe cycle tracks in and around the city. Nearly every Copenhagener owns a bicycle - as there are almost 800,000 cycles in Copenhagen. Over 60% of all Copenhageners cycle back and forth to work - to the nearest station or to other public transportation services. There are over 360 km of save cycle tracks around the city - and should the cyclist have a green wave between traffic lights - the speed on a bicycle can easily reach 20 km per hour. Cycles are widely used in the summertime - due to the suitable weather conditions - even though the cycle tracks in the winter period are effectively cleaned for snow or other obstacles. Around 400,000 cyclists use their cycle’s everyday to commute back and forth to work - or leave their cycles at bus stops - train station or at other public transport venues. Copenhageners cycle averagely 800 km yearly on their precious bicycles. The first separate bicycle tracks was established in Copenhagen around the Lakes in 1910 - to secure the heavy growth of cycles on the road at that time. When you cross a cycle path - look before you leap - as some cyclist in Copenhagen ride very fast on the cycle tracks - that they sometimes are considered to be the "loose missiles" of the city - as all cyclists in Denmark have first priority in the traffic. So take every precaution - when you see a cyclist in Copenhagen. But there is an astonishing good cycle culture in Copenhagen - and cyclist will take good care of all tourists and visitors. So - don’t play “Adventurous or Courageous Pedestrians” in any way in Copenhagen - as there are numerous of “Pit Stops” like pedestrian “Zebra Crossings” all over town. The Danes have been cycling back and forth in their towns for more than 100 years - and have gained a certain form of special and kind cycle culture - and the Danes just love their bikes. The first separate bicycle paths was established in Copenhagen around the Lakes in 1910 - as the existing bridle paths was converted into isolated safe Cycle tracks to secure the heavy growth of cycles on the road at that time. Since bicycle paths has been created all over Denmark and is a part of the safe cycling culture in nearly every Danish city. 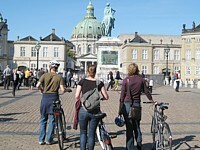 We conduct Cycling Tours for groups in Copenhagen and all over Denmark. 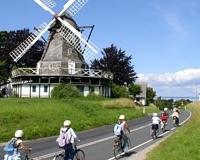 Especially the Isles of Bornholm - Samsø - Lolland & Falser plus Møn are perfect cycling location with limited distances for day tours between attractions and lodging facilities. Visit the city by cycle. Start at the Town Hall Square - and then to other tourist venues. You will always be near any beach area - when you live in Copenhagen - and it’s easy just to take a cycle trip for a swim or for sunbathing. There are many nearby attractions and historical places that can be reached by cycle from the city centre and Town Hall of Copenhagen. 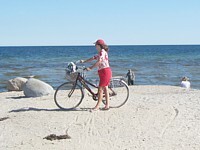 Cycling in Denmark is great fun for everyone - who just love to spend their vacation on a bike. There are many rules and regulations for vehicles and drivers - when crossing the Danish borders. This and other traffic signs will meet motor vehicle drivers crossing the Danish borders. In Denmark everyone drives on the right side of the road - and remember - always with your head lights on. All the road signs use standard international symbols and sometimes include Danish text. 1 kilometer is equal to 0.6 miles. 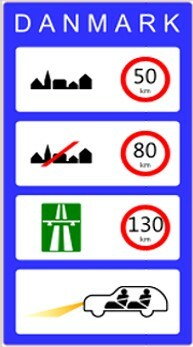 Speed limits in Denmark is 50 km/h in towns and built-up areas - 80 km/h on open roads - and 110 km/h on the highway (some parts allow 130 km/h with posted signs). There are special speed limits for trailers - caravans and mobile homes. In Denmark - seat belts must be used at all times - and there must be a seat belt for every person in the car. Make sure to carry a warning triangle in your car - and use it when stopping on open roads or highways. Parking cars unlawfully will result in a fine of over DKK 600,-. It’s a must in Denmark always to keep your headlights on. Just don't drink and drive with alcohol or drugs in your body. The legal limit for alcohol in your blood is 0.05 per cent in Denmark - anything higher than 0.05 - one will receive a very high fine - hard punishment - as well as a jail sentence! Always carry your driving licence - vehicle registration document - and certificate of motor insurance with you. You must be 18 years to drive a car or motorcycle in Denmark - and motor cyclists must use a crash helmet at all times. If involved in a traffic accident in Denmark - one must call 112 to receive help and support from the Danish police - fire department or ambulance.